Juice Pack Reserve: Small battery pack that's lightweight and portable. Charges an iPhone or iPod with no cables (it connects through a device's dock) with a 700 mAh battery (twice as fast as 500 mAh batteries). Shipping September 30th. $34.95. Juice Pack Boost: External battery for iPhone and iPod that doubles as a stand, and features a 2000 mAh high output battery. An integrated LED indicator lets you track battery status, and the ultra slim design make sure the unit is extremely portable, too. Shipping September 30th. $49.95. 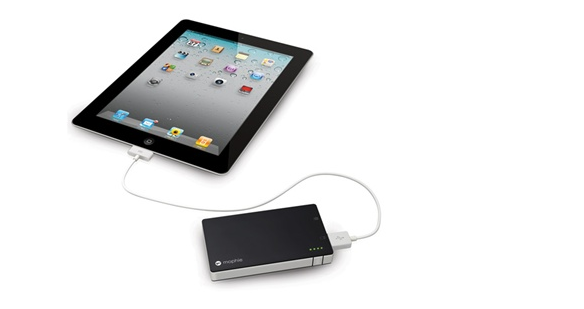 Juice Pack Powerstation: 4000 mAh external battery that can charge iPhones, iPods, and iPads, as well as "virtually" any USB device. The Powerstation is also compatible with several Android and BlackBerry handsets -- a full list is available on Mophie's website. Shipping September 30th. $79.95. Today, Mophie has also confirmed the availability of Pulse, a gaming grip for the iPod touch 4G that brings enhanced sounds and feedback to the device. Gaming feedback is provided by ViviTouch Technology, and Mophie claims the Pulse will increase usability of all kinds of apps, not just games. It's difficult to imagine how a gaming grip would enhance, say, a note-taking app, but we applaud Mophie for the effort nonetheless. Demo video is available here. The Pulse is $99.95 on Mophie's website.